Print: "Mary, Refuge of Holy Love" with blue sky background (8"x10"). Print: Mary, Refuge of Holy Love (8x10). 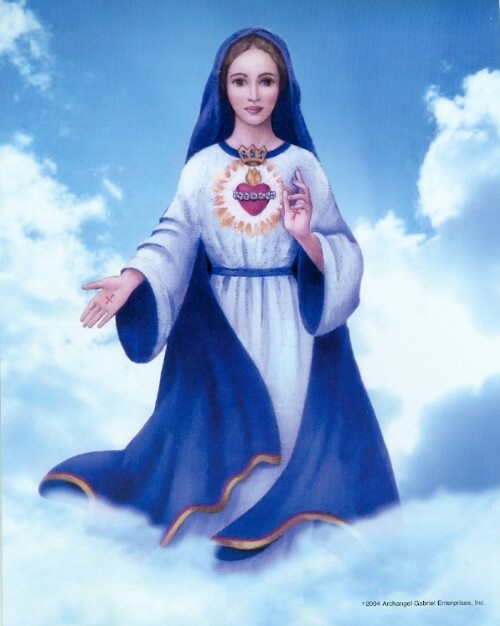 Print of Mary, Refuge of Holy Love with blue sky and white cloud background. 1) It is a fortress against evil and should stand guard over every heart and home. 2)Those that do so shall not have anything to fear in these tribulations which are at hand. 3) Many and particular graces will come to you through this Image. 4) This is your fortress against evil, against much that will occur in the world. 5) Understand and believe, My dear children, that it is the invocation Mary, Refuge of Holy Love, Pray for Us that is your protection and your defense. Dear children rely on the Image of My Heart that reminds you of this certain Refuge. Blessed Mother says: "Praise be to Jesus." "Get this image (Refuge of Holy Love) out to the public. It carries with it very many special graces which the world needs today." "Those who venerate* this image, either in picture or three dimensional form, will be drawn into deeper personal holiness. Their thoughts, words and deeds will be clarified in Holy Love." "Please understand the key word here is 'venerate'. The image is not magic. Graces will be given according to what is in the heart." *Venerate: Does not mean "to worship" or "pray to." Rather, it does mean to pay honor to a saint in Heaven (e.g., Blessed Mother) who, when asked in prayer, will by intercession and own example of sanctification, help the faithful on earth to grow in Christian virtue and holiness. Venerating the saints does not detract from the glory given only to God in worship, since whatever good they possess is a total gift from God's bounty of graces.